Experience Advertising - Your brand, your message, will be delivered into an interactive projection advertising campaign, strategically placed in high traffic convention center corridors. 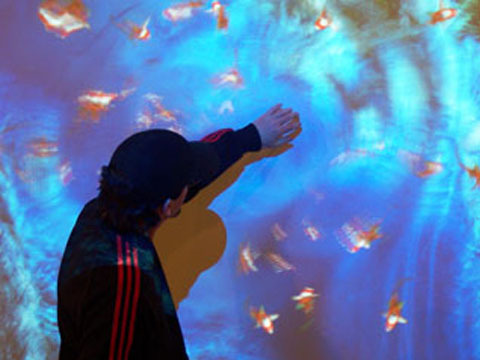 Attendees control dynamic multimedia interactive displays with simple gestures and body movement. It’s an engaging full-body interactive experience that immerses users in your message and draws them to your brand. Ground Projection - Ground FX is a multimedia visual display system that projects incredible interactive floor special effects, floor games or floor advertisements directly onto an interactive floor displays. Wall Projection - VideowallFX This digital wall technology delivers eye-catching dynamic visual content that can be projected onto virtually any surface. This creates a full body interactive wall experience where the user controls interactive wall special effects, advertising and games with simple hand and body motions.